Whether for breakfast or in between, this American peanut cream is becoming more popular with us. I too love peanut butter so much that some time ago I decided to make it myself. Good that the do-it-yourself version of the classic is so easy and fast to copy! Strictly speaking, the peanut is actually a legume and has high protein and magnesium content, this makes the peanut an absolute superfood and is, therefore, a standard in my fridge. Not only is it suitable for the vegan breakfast, but also in different recipes, it is versatile, for example, as an avocado-peanut smoothie or in combination with coconut milk as a sauce to tofu and broccoli, etc. The basic idea of the process is that the peanuts are first roasted, which intensifies their aroma. Then they come into the kitchen utensil where they are crushed and then ground until the oil contained in the peanuts comes out. Then you can refine your mus. About 230 g of unsalted, peeled roasted peanuts. 2-3 tablespoons of oil (sunflower, rapeseed or peanut oil). Roast the unroasted peanuts in a non-oiled pan evenly from all sides. Or, you can also use the oven and then roast the peanuts at 180 ° C for about 15 to 20 minutes. They should be beautiful golden yellow. After cooling, add the nuts together with the remaining ingredients to the blender. In the machine, they are first chopped, then ground, then to a coarse paste and finally to Mus. The shorter the mass is crushed, the more nut bits are retained. Whether you like the peanut "crunchy" or rather "creamy", is up to you at this point. If the mass is too firm, you can add some oil if you wish. After mixing, the peanut mass is still slightly liquid due to the heat generated. This can now be poured into the glass, and stored in the fridge - finished is the homemade peanut butter! To make it sweet: You can add honey, syrup(as used in above example) or raw cane sugar to taste. Vanilla, cocoa or cinnamon also go well with the sweet variant. To make it a bit salty: Add untreated sea salt to taste. To make it spicy: Add salt, paprika or chili powder to taste. Garlic is also doing well. 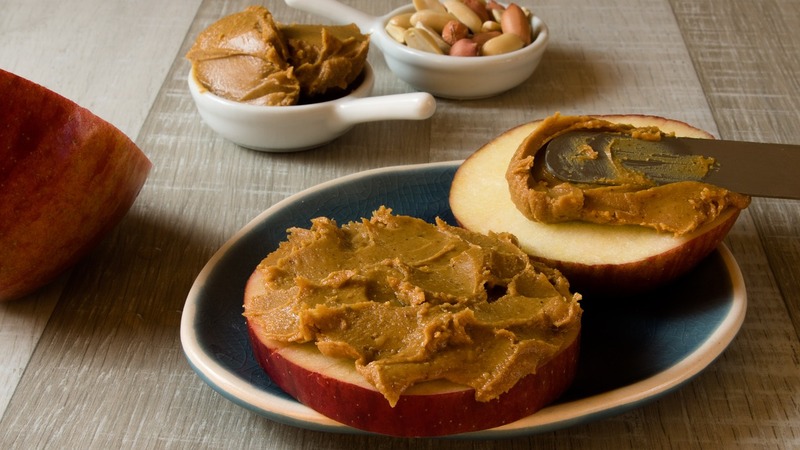 Well here you go, you just made yourself a homemade peanut butter! In a tightly closed jar, this will stay in the fridge for about a month. Open your eyes while roasting. Here you can influence the taste very much. So always focus on oven or pan and try it out. Select slow level on the mixer. Add herbs, salt, and other spices to the peanuts as it cools down. Just so you know: The healthiest peanut butter is made only from peanuts, whereas if you add salt, sugars, and fats it changes its nutritional profile. For example, a peanut butter with salt can have between 100 and 150 milligrams of sodium, while one without salt has no sodium. Extra oil makes the finished peanut butter creamier. Homemade peanut butter has a different consistency than purchased. So do not be surprised if it is a bit thinner at room temperature. That's why I always store my food in the fridge. Be brave and try unusual combinations.